Pipe Shields, Inc. to Value Engineered Products, Inc. Welcome to Pipe Shields, Inc. 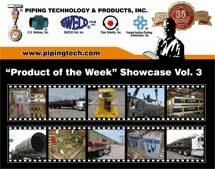 In business since 1971, Pipe Shields Inc. established itself as one of the world's leading designers and manufacturers of a unique line of pre-insulated pipe supports, slides, guides and anchors. Pipe Shields innovated methods to produce a consistent, uniform, and non-labor intensive insulated pipe support constructed to prevent direct heat transfer between pipes and their supports. Pipe Shield, Inc was acquired from the Shaw Group in August 2004 by Piping Technology & Products. For more than 10 years Pipe Shields and Piping Technology & Products have reached throughout world markets to design and develop for power, petrochemical, chemical and commercial industries. The accomplishments of our high quality products are a direct result of years of research and engineering to create cost efficient products. For smaller loads and movements. Commonly used on chilled and heated water systems. Most popular with mechanical contractors. For larger loads (vertical and lateral) and movements. Supports the pipe from below. Commonly used in heavy industrial and large HVAC distribution systems.Slide plates and guides are optional. For larger multi-directional loads and movements. Supports the pipe from below. Restrains movement of the piping system. Used in heavy industrial and large HVAC applications. For larger loads and movements. Supports the pipe from above (with one or two hanging rods). Used in heavy industrial and large HVAC applications. For both smaller and larger loads and movements. Supports the pipe in a vertical "riser" configuration. For commercial, light and heavy industrial and large HVAC distribution systems. Misc. pipe clamping hardware (typically used in conjunction with Pipe Shields A1000 through A9000 series insulated supports). Why should I use insulated pipe supports? The insulated pipe support can save you money on your bid and on the job. Read more..
Are there any other reasons why I should consider insulated pipe supports? Insulated pipe supports also provide reduction in noise and vibration. Insulated pipe supports on hot lines provide for personnel comfort and protection in tunnels, corridors, mechanical rooms and other tight places. Read more.. Explore how Polyurethane foam is produced, from mixing polyols and isocyanates to inspecting the final product. Learn about anchor shoe testing, lateral load testing, compressive strength testing, and axial load testing.